Flows at 99 CFS. The fishing at Deckers has been fair to good at Deckers. The flows were cut by about 40 CFS on Christmas, but Deckers is still flowing at 99 CFS at Trumbull. 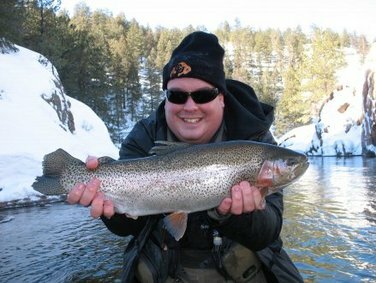 You should be targeting the deeper, slower water that the trout seek out in the winter months. The prime fishing time has been around midday, think from 10AM – 3PM. In terms of flies, think small. Red, cream, brown and black midges have all been turning fish, in sizes 20-24. It’s never a bad idea to throw small emergers, especially midday, like the Top Secret Midge, Chocolate Foam Wing, or Mayer’s Tube Midge. Other reliable midge patterns are the Black Beauty, Bling Midge, Steve Parrott’s Chironoflash, and the Mercury Blood Midge. With these small flies/flows, it is important that you throw 6x tippet, preferably fluorocarbon. On the right days, look in the softer areas for dry fly opportunities. You are not going to see a lot of ‘splashy’ rises, but rather just the fish’s nose sticking out slurping the bugs in. In these situations, it’s hard to beat a small Parachute Adams, Griffiths Gnat, or Matt’s Midge – all sizes 22-24. In terms of attractors, you want to throw eggs, stoneflies, cranefly larva, and worms. Cranefly Larva are often overlooked by fly fisherman, but they can provide some great fishing in the colder months. Look at Joe Shafer’s Gummy Crane, it’s one of the best cranefly patterns we have thrown. As always, there are also a good number of stoneflies in the South Platte. You want to try smaller Pat’s Rubber legs (#10-#12) and other smaller dark stoneflies. Eggs and worms will also be a good choice, but be wary as the fish see lots of these flies.